Beautiful interior dimly-lit and filled with luxurious decor pieces and lavish tents draped with shimmering sheers illuminated by a single hanging elegant chandelier. You can hear the subtle sounds of romantic Moroccan music as you cozy into plush seats. Moroccan traditions of hospitality were born of the Berbers’ nomadic life. A Sultan (Prince or ruler) would have a beautifully decorated tent with intimate alcoves, and these were echoed when they built even more lavish royal palaces. 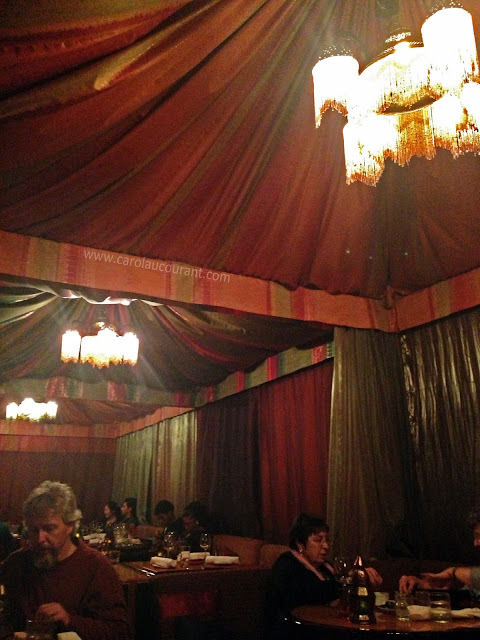 The Sultan’s Tent evokes the setting of a traditional “diffa” (lavish) banquet) at which all are welcome and where the dining philosophy was one of abundance. 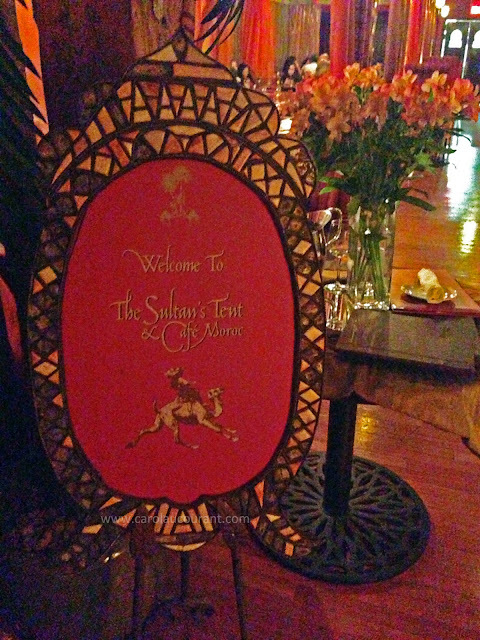 For all the years I have lived in the city, I still cannot believe I have not had the chance to experience this unique dining experience at The Sultan’s Tent. On the search for some of the distinctive dining spots in the Toronto and GTA, I knew I had to give it a whirl. 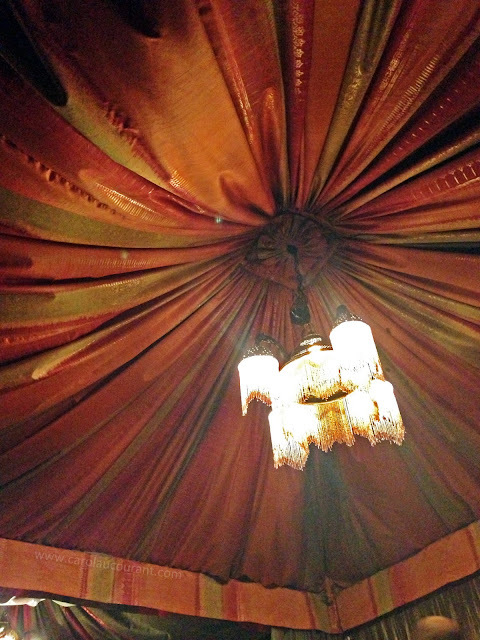 Immediately upon entering The Sultan’s Tent, I was impressed with the overall look and ambiance. 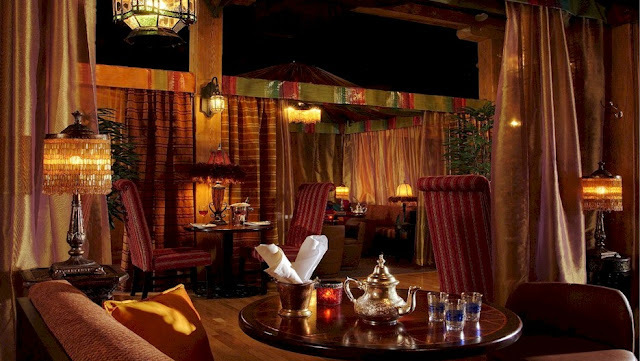 Café Moroc nestles in the front of the establishment with bistro table sets, lovely Moroccan lanterns hanging from the ceiling & large pieces of art adorning the wall. 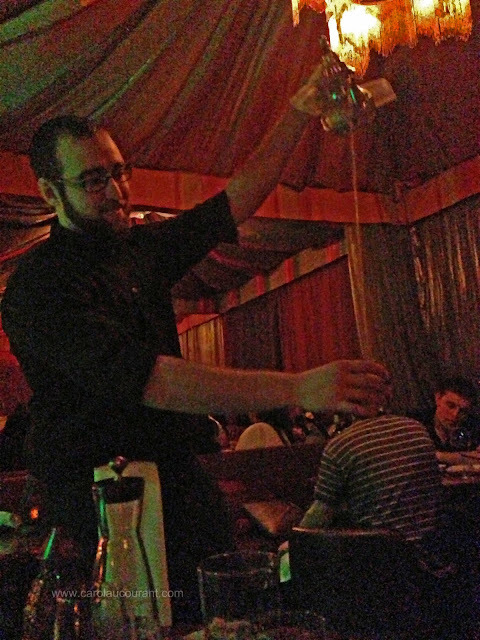 In the centre of the restaurant is the tastefully-decorated bar separating Café Moroc from The Sultan’s Tent. One of the most important parts of an overall amazing dining experience is not just the food and ambiance, it’s also the people. The reception from each and every worker was friendly and hospitable and I cannot emphasize how wonderful our waiter was. The Sultan’s Tent was a whole different area in it’s own. 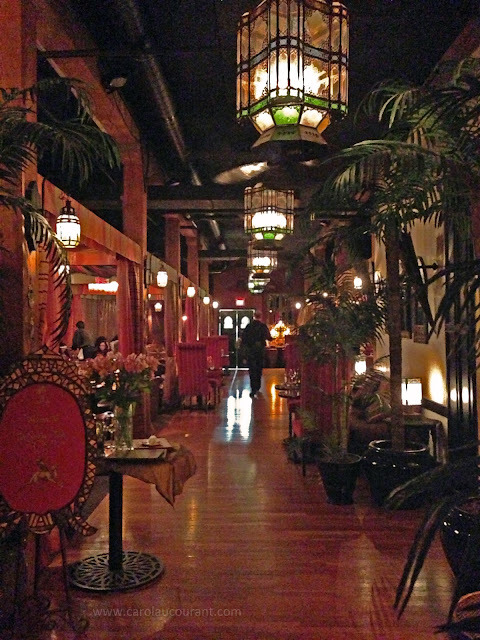 Moroccan-style tents with chandeliers and wrap around seats made for a very different dining venture. Individual tables with 2 high-back Queen Anne Chairs ran alongside the tents on the dancer aisle. Although it’s pretty open concept, it doesn’t feel that way when you’re seated. It’s very intimate. The dinner is 4-course with a great selection starting from $39.95. It does not, however, come with drinks, just water. Water aside from sparkling, pop and any alcoholic beverage is additional cost. Would be really good if they included a drink with the four-course meal. Aside from that, including the live belly-dancing, generously sized four-course dishes and overall dining experience, I would say the price was pretty decent. Here are shots of the menu. Your order is taken all at once which I liked because it comes to you at a good pace without having to wait too long in between courses. 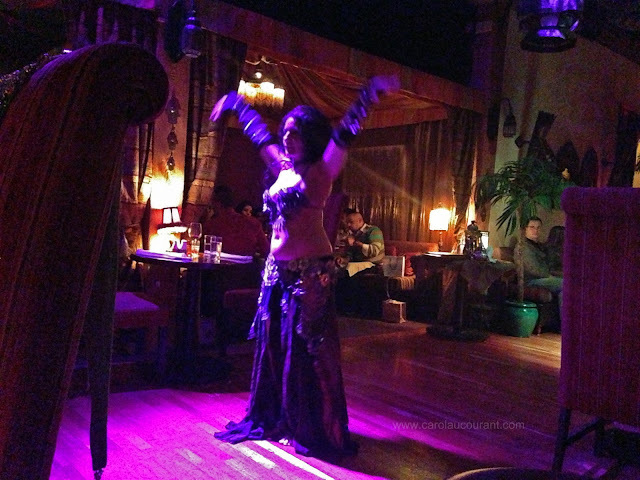 On top of that, the Belly Dancers come out to perform mid-meal so having all your dishes pre-ordered makes a lot more sense. Before ordering the food, we treated ourselves to some drinks. 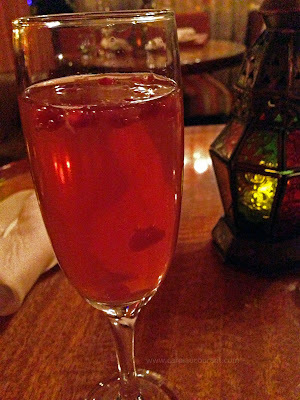 I tried the signature drink called Fez Royale made with Pomegranate and White Wine and my husband opted for a cold glass of Spanish Beer (they did not have Moroccan Beer otherwise we would have ordered it!). 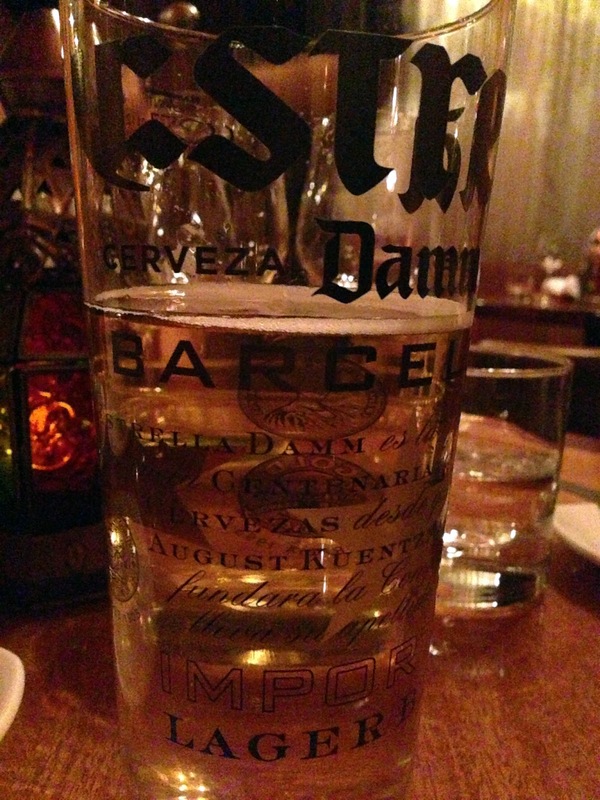 Is there such thing as Moroccan Beer? Loved the Fez Royale! So much that I actually had two. I wasn’t driving and a night away from my kids? Cheers! 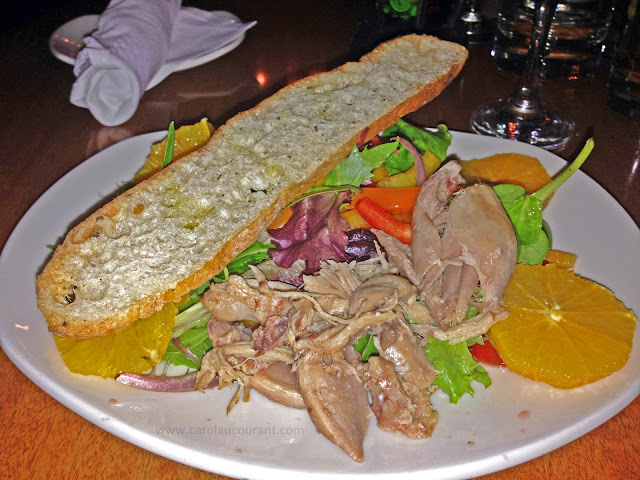 For the first course, we tried the Duck Confit Salad and the Soup du Jour which was an Asian Noodle Soup. The champagne-pomegranate vinaigrette paired so nicely with the pieces of cool duck, lettuce, romaine and veggies. With the added tangerine slices, it was a citrus-sweet delight to my senses! The salad was a generous size. The soup du jour, Asian noodle soup, was just okay to me. It did not blow me away. However, the mix of seasonings with the broth was comforting. 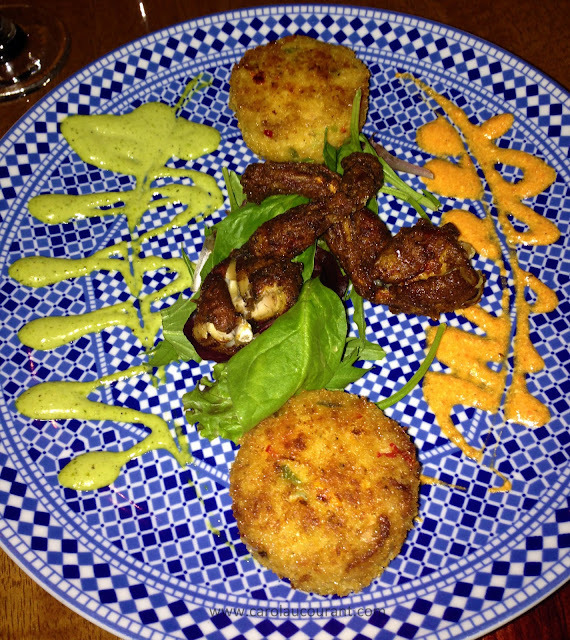 For the 2nd course, we tried the ever-so-popular Maftoul and the Moroccan Crab Cake. 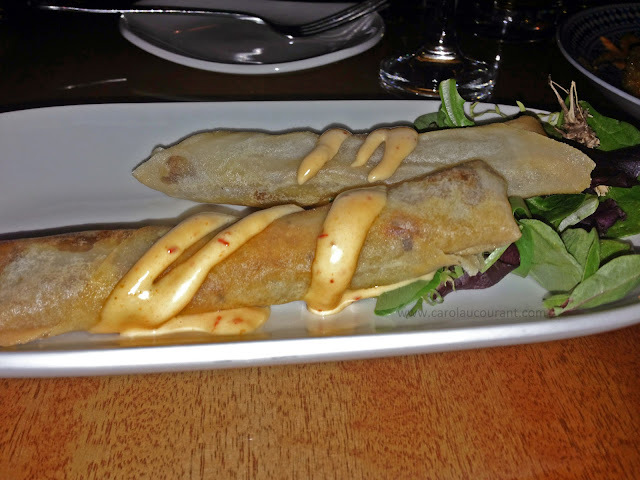 These hand rolled Moroccan “Cigars” are a hot-crisp pastry stuffed with a mixture of mildly spiced beef, cashews and raisins. It was surely tasty! With the chipotle aioli giving it a little added kick, it pairs very well with any of the first courses, either a soup or salad. They were 2 good sized cigars perfect for sharing (but you may not want to…). I will have to admit though despite the Maftoul’s deliciousness and popularity, I was actually liking the Moroccan Crab Cakes a little bit more. The crab blended with mixed spices, sweet peppers and toasted bread crumbs was a winner for me. Especially paired with the shermoula emulsion and roasted red pepper harrisa! This also came with crispy frog legs. I am usually pretty adventurous and open with trying all kinds of foods but I just can’t stray away from the image of a frog so I couldn’t. That’s just me. I have this odd thing about frogs (a whole different story). This should not, however, influence your decision to try it because according to my husband and pretty much every one else I know that has tried this delicacy, it taste much like chicken. I took a bite and surely it did taste like a crispy fried chicken. Just not my cup of tea. For the 3rd (and main) course, we went with a Seafood Royale (I love my seafood!) and the Veal Chop. These are added cost dishes but well worth it. They were both well-prepared, well-seasoned and very delicious. As if the photo isn’t appealing enough, the dish itself was delectable. A 10-ounce grilled chop (we had it medium-well) topped with a braised cremini mushroom demi-glace with Yukon gold garlic mash with seasonal veggies. 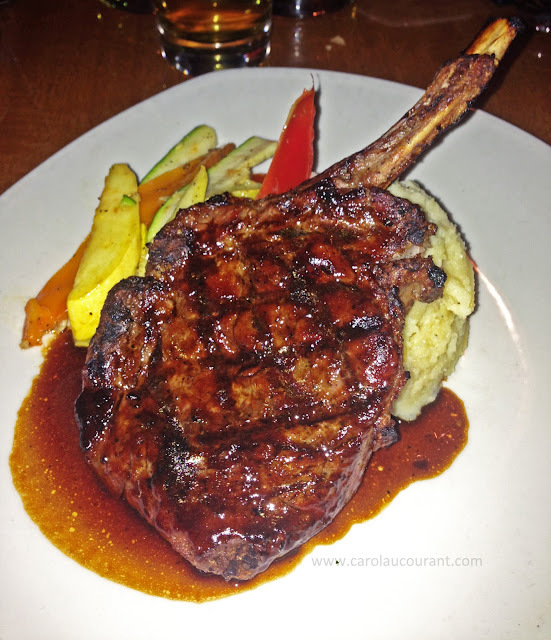 The chop was grilled just right, still juicy in the inside with the perfect chewy texture. 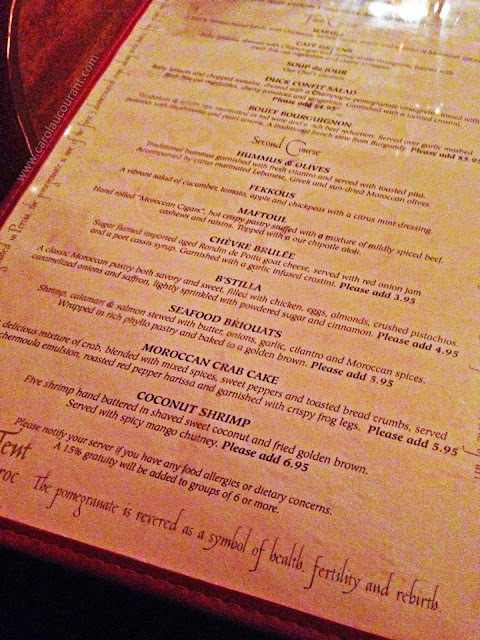 Being a big seafood lover, I usually never go into a new restaurant without trying out one of their seafood dishes. 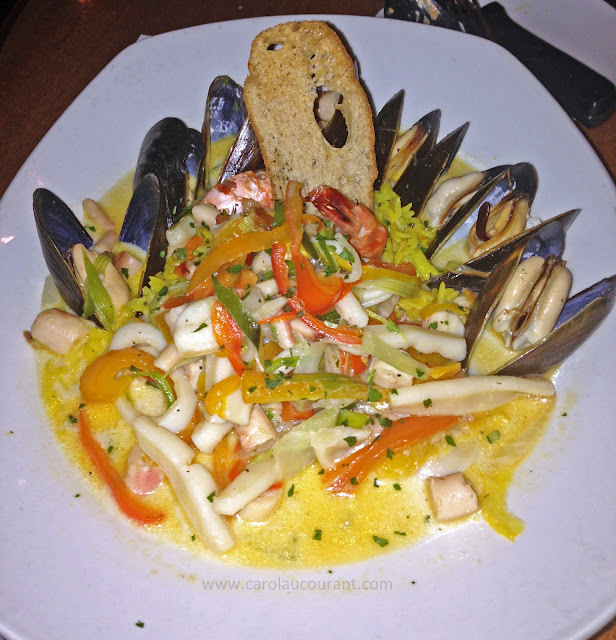 The Seafood Royale was comprised of jumbo shrimp, scallops, mussels, monkfish and calamari mixed with traditional Moroccan root vegetables in a saffron fennel broth with butter over saffron pilaf rice. Mmm, so very good. I love when seafood, saffron and butter combine. Such a perfect marriage. 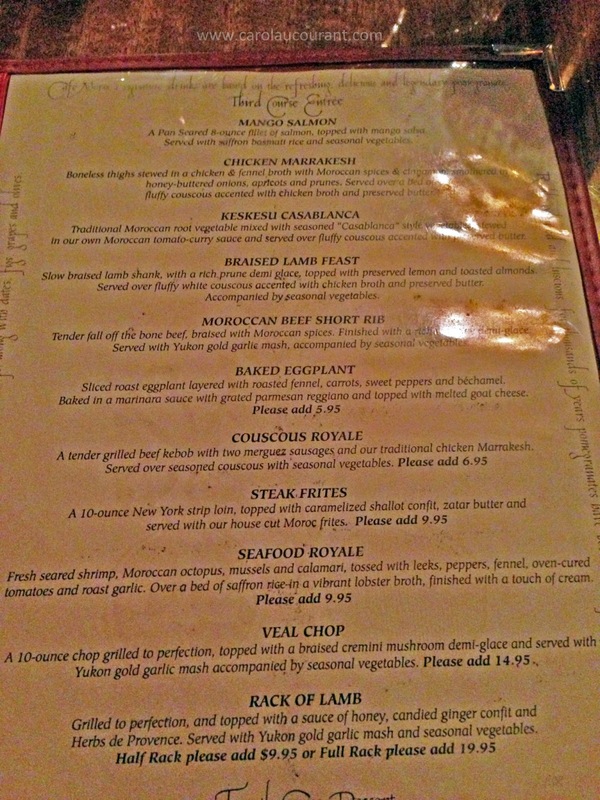 I also liked that there was A LOT of seafood; the portion was very generous. I ended up bringing my leftovers of this home since there was a lot and even after many hours and re-heating, the dish was still delightful. During this course, the sheer drapes around the tents were being opened by the attendants and lights in the restaurant became dim. The music began to play and a spotlight dawned over the centre of the Dancer’s Aisle. (Apologies for the poor photo quality here; it was dark and I did not want to use my flash to ruin the performance for others or distract the dancers). 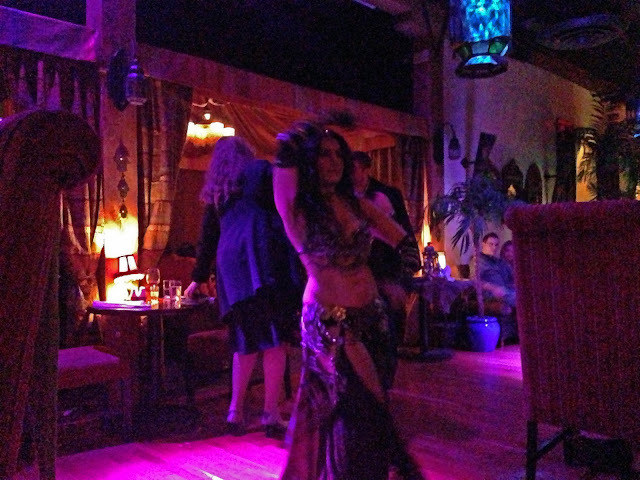 The Belly Dancers were phenomenal and truly talented in their art of dance. I absolutely loved how they captivated the customers and engaged them (only if they wanted to) in their performance. There were a lot of people that enjoyed taking part and learning some new moves. It was really fun to watch! I remember many years ago I took up a couple of belly-dancing courses for fitness — such a great experience. The music was lovely (with a mix of sensual and romantic Moroccan, Spanish, African & more sounds) and the outfits were exotic and pretty. I really wanted one of those belly-dancing scarves you can wrap around your hips. You can purchase one if you like for $30 and they come in different colours as well. Here’s a sampling of the live performance. During this performance, we were served Maghrebi Mint Tea (Atai). This requires a very special shout-out on it’s own for how good it was. I need to get my hands on this tea to bring home. 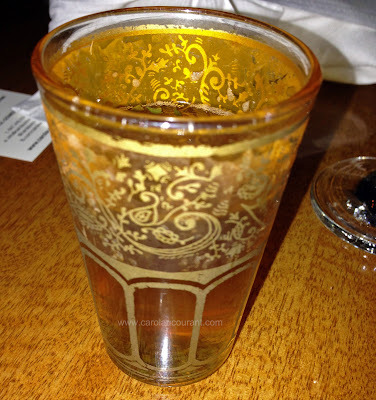 Maghrebi mint tea (Atai) is a green tea with mint leaves. It is poured from a distance to produce a foam on the tea. For the final and 4th course (dessert), we were excited to try the Brûlée Royale and Chocolate Oasis. The Crème brûlée Royale was to die for! It is now officially one of my fave Crème brûlée’s I’ve had so far (and I’ve had a lot including the ones in Paris). I loved that the top was loaded with pistachios – I LOVE pistachios! It was rich (but not too sweet) and so creamy. I am urging you to try this. 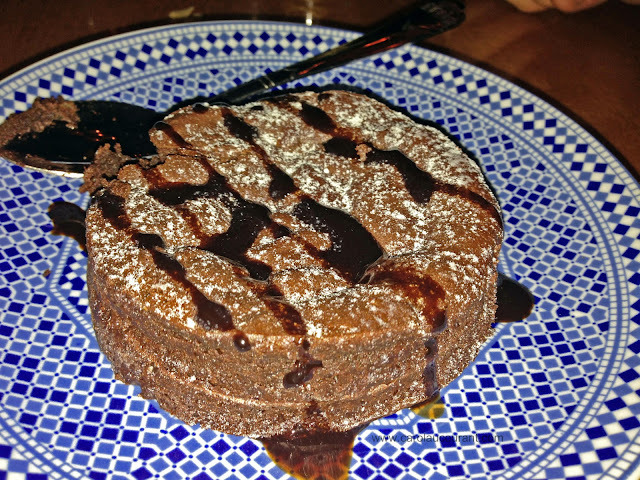 A dense chocolate cake made with semi-sweet chocolate and butter sprinkled with powered sugar and drizzled with chocolate syrup, the Chocolate Oasis is truly a Chocolate Lovers dessert. I enjoyed it as it was not too sweet, lush and moist. We had an entertaining and unique dining experience at The Sultan’s Tent and I have to say that it is a must-visit if you are in and around the Toronto area. I’m a big fan of live entertainment while dining and The Sultan’s Tent did not disappoint in this aspect. It’s a great place to go for an intimate lunch or dinner, some fun times with friends and especially great for small parties. You can reserve an entire tent or two (or three) depending on how big your party is but it will be an enjoyable time, most definitely. 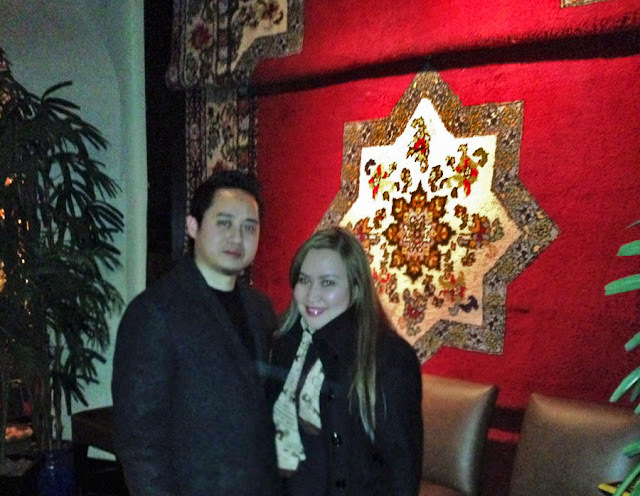 The Gorgeous Hand-Woven Moroccan Rug hanging behind my husband and I was actually a gift from the present King of Morocco’s father, Hassan II, who inspired a renaissance in the country’s arts and crafts. Stunning! To learn more about The Sultan’s Tent, including hours and Belly-Dancing show times, you can visit them at: http://www.thesultanstent.com. « Happy 1 Year Anniversary GLOSSYBOX! There’s a place with the same name in Calgary. 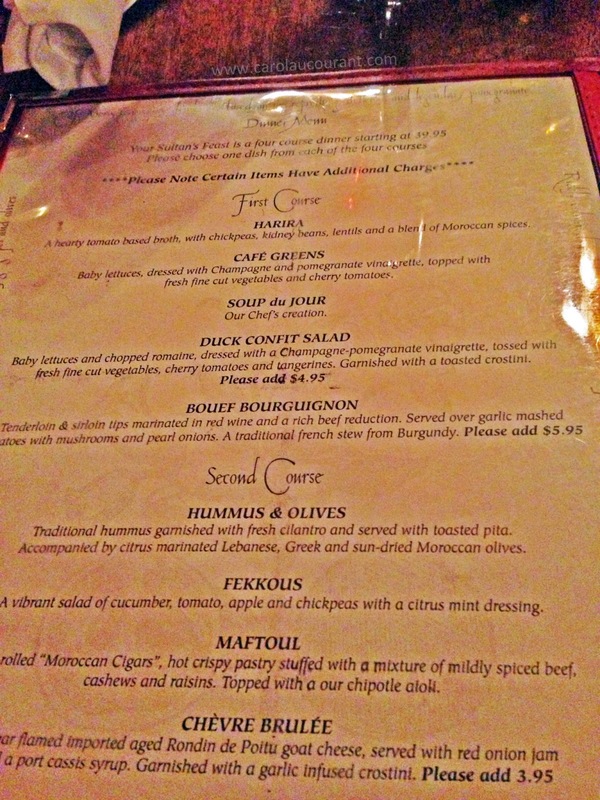 The creme brulee looks soo good, I would try the Baked Eggplant. I love the Sultans Tent! I’ve been there with my hubby before and we love it. What a beautiful place. The vibe from the pictures just transported me there. And the menu looks absolutely amazing! 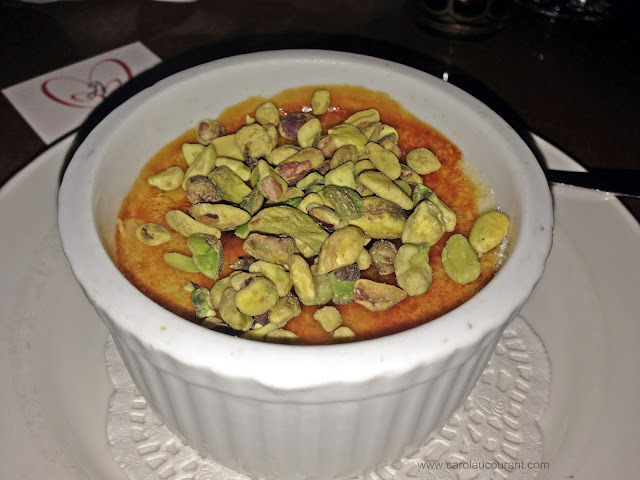 All of the pistachios on the creme brulee look awesome. I have never heard of this restaurant. Looks fun. My parents went here once year ago, I think you have just inspired me to go back! Thanks for the review. Looks like a unique experience. Great pics! I’ve been here once a few years ago and now I wanna go back! Such great food! How long was the belly dancing performance for? 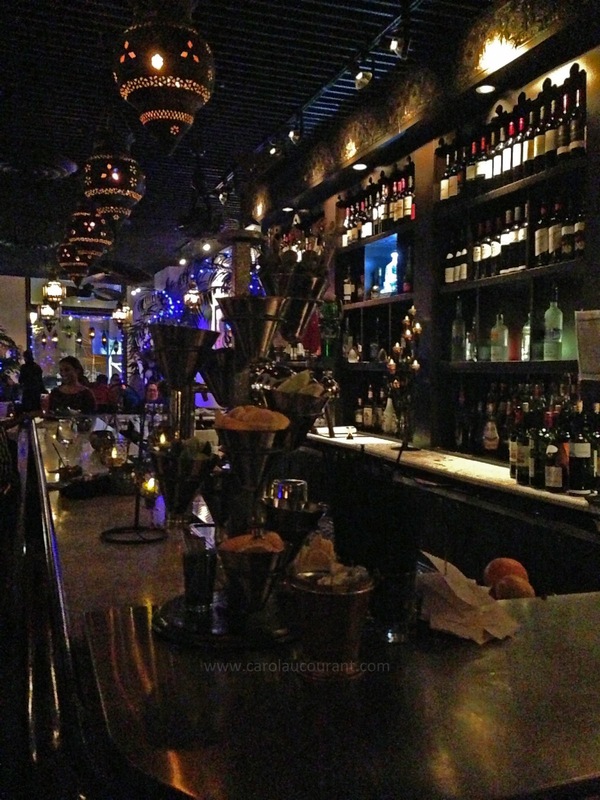 J.Patel: I have never been there prior to but I have heard the same thing — definitely worth another visit. 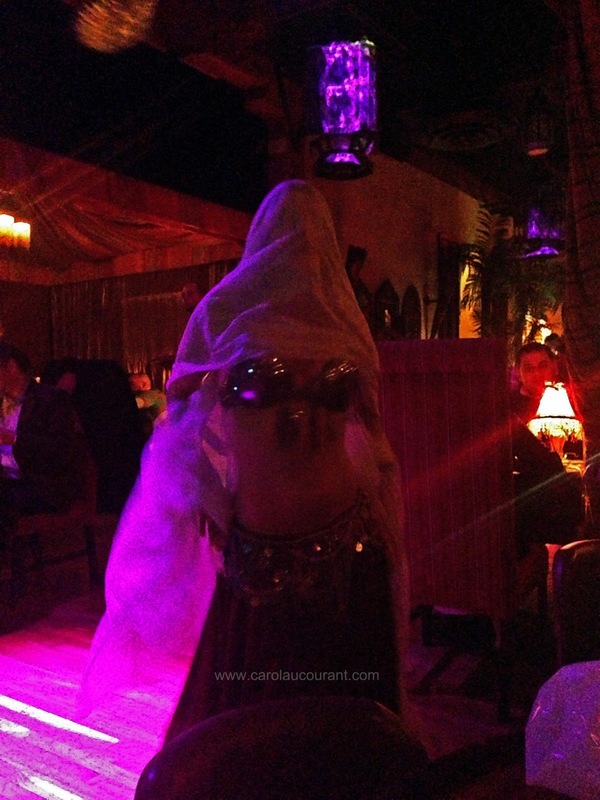 Anonymous: I would bring my child in during lunch or earlier dinner before the live belly-dancing (she’s 4) because she would enjoy the food just may get too rowdy during a show. Children old enough to sit through a live performance like that should not be a problem. S.M: It was amazing! I’m know craving for it! I will have to try that creme brulee now! Looks and sounds good! Would you say it’s kid-friendly? Someone told me it is but she’s not a parent so I’d love to hear what you think. Great pictures! Thanks for sharing your experience. I’ve gone years back and I didn’t really enjoy it back then but it looks like there’s been some changes (bigger portions….). I will have to step in there again and try it out. Thanks! This review is making me so hungry! Does not help that I am reading this at my work desk (working overtime) with a grumbly tummy. 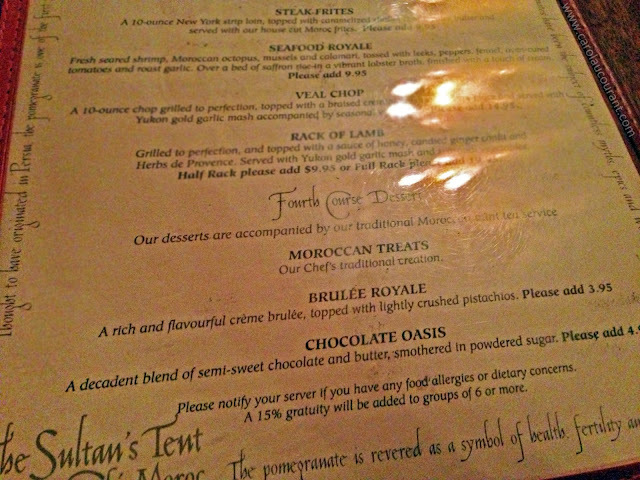 I have never been to The Sultan’s Tent yet (have always been meaning to) and have heard mixed reviews. Your review though has urged me to go!